Whether you need a stage for your entertainment or a guest speaker, Lorio Ross has top-of-the-line staging for your event. Lorio Ross can provide everything from simple LED up-lighting for your event, to a full scale production complete with professional intelligent lighting and fiber optic curtain backdrops! Lorio Ross can deliver the perfect sound system for any occasion, from corporate meetings to DJ's or national acts, along with professional sound engineers and live mixing. Table centerpieces, chair covers, linens, drapes, and especially theme decorations are all specialties of Lorio Ross Entertainment! Whatever you need, we can make it happen. 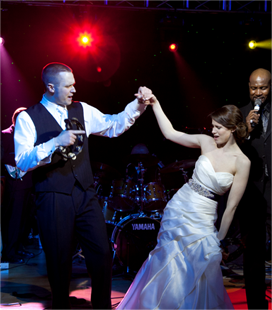 Known for Providing the Best Wedding Entertainment in Michigan, Lorio Ross can Make ANY Event Unforgettable! 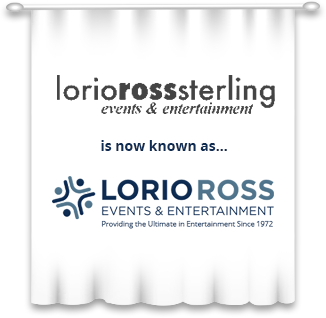 Since its foundation over 40 years ago, Lorio Ross Events & Entertainment has evolved into one of the largest full-service entertainment and production companies in the Midwest. Whether it’s providing their expertise to many of the Fortune 500 Companies across the U.S., helping someone secure a band or DJ for their local wedding reception, or providing complete event planning services from start-to-finish, the expectation of quality and service remains the same. The bride & groom were so happy & grateful I thought they were going to start hugging the band! I don’t know if you noticed, but at one point even the wait staff was dancing! Joyce H.
New Name, Same Great Entertainment! Lorio Ross Sterling Entertainment is now known as simply Lorio Ross Events & Entertainment. We are excited to continue our 40-year tradition of providing exceptional service and top entertainers under this new name. With the same leadership and staff on hand, you can rest assured that the very team that built our amazing reputation will also make your event unforgettable!